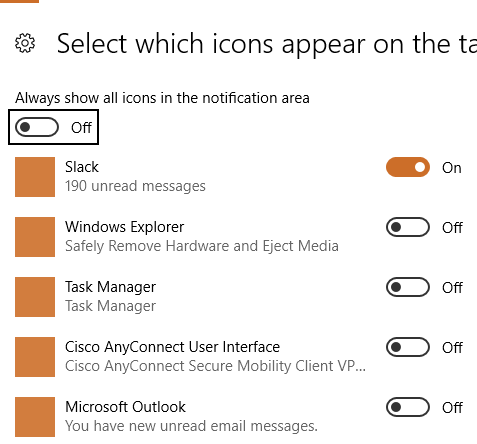 I've added Slack to the notification area of the taskbar by going to Settings and finding Select which icons appear on the taskbar section. I switched Slack on on and all was good. Eventually, after a month or two, Slack disappears. I go back into Select which icons appear on the taskbar section and sure enough, Slack is set to off. I suspect that's because Slack keeps updating itself and the EXE itself is changing. But that's just a guess. Unfortunately this is a really annoying bug we have in the desktop app. When a new update is installed, it's placed in its own subdirectory within the Slack folder inside your %localappdata% folder. Not the answer you're looking for? Browse other questions tagged windows windows-10 taskbar notification-area or ask your own question. Is there any way to get Windows to keep a taskbar icon always visible, even when updates to the program would unset that?